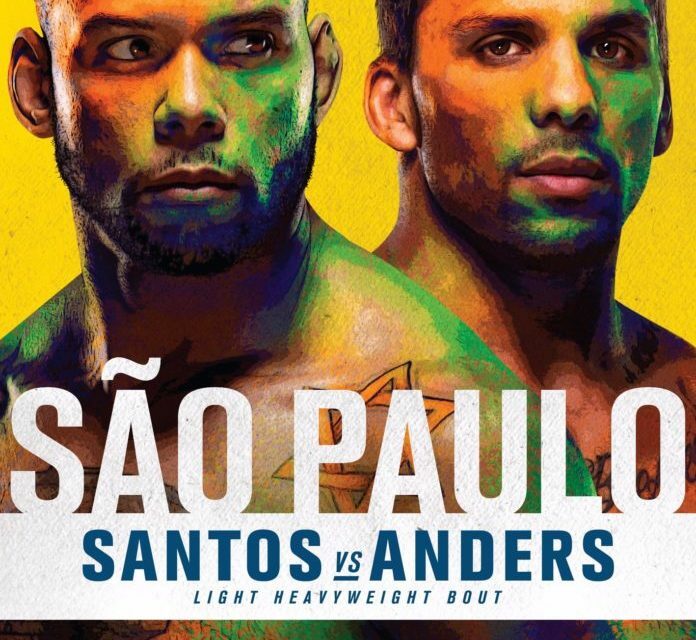 Thiago Santos Vs. Erik Anders. Thiago Santos def. Eryk Anders in their middleweight bout at UFC Fight Night 137. Thiago Santos was victorious in what was his first-ever Ultimate Fighting Championship main event bout as he wound up stopping Eryk Anders in a thrilling back-and-forth war at UFC Fight Night 137 in Sao Paulo, Brazil. “Marreta” rocked Anders repeatedly in the contest, but the former University of Alabama football standout kept coming back, throwing bombs and scoring takedowns. With Santos tiring out in the third and with “Ya Boy” seemingly in control of the action, the Brazilian turned the tides for good. Late in the frame, Anders scored another takedown, but with Santos’s back against the cage and Anders driving into him, “Marreta” dished out several short, sharp elbows to the head. When the horn sounded to end the round, Anders couldn’t make it back to his corner. Anders (11-2) twice stumbled to the ground, even with the help of his corner, and that prompted referee Marc Goddard to halt the contest. The official result was a TKO win for Santos (19-6), which came at the end of the third. ‘Cowboy’ Too Much for Pedersoli Jr. Fan favorite Alex Oliveira made quick work of Italy’s Carlo Pedersoli Jr. in the co-main event on Saturday night. Pedersoli Jr. ducked low to issue a kick to the body, but “Cowboy” caught his foot and slammed a right hand to the Rome native’s temple. “Semento” fell like cement to the canvas and from there, the Brazilian rained down punches to the head until Pedersoli Jr. (11-2) was out and referee Jerin Valel jumped in. The end officially came just 39 seconds into the fight, adding more intrigue to the deep welterweight division. The highlight-reel knockout allowed Oliveira to soar to 19-4-1. After being away from the Octagon for nearly two years, longtime veteran Antonio Rogerio Nogueira turned back the clock a little bit on Saturday night. The Brazilian plunged his fists deep into Sam Alvey’s head early and often in the second round, rocking him repeatedly. With “Smile’n Sam” (33-11) reeling and stumbling around the cage, the Pride Fighting Championships vet chased him down, letting his hands go. Finally, a loopy left hook to the temple dropped Alvey, prompting Marc Goddard to step in while Nogueira (23-8) continued to rain down punches. The end came exactly one minute into the second. Legacy Fighting Alliance and CES MMA veteran Andre Ewell was terrific in his Octagon debut Saturday as he edged former UFC bantamweight world champion Renan Barao in enemy territory. Barao took “Mr. Highlight” down in the first and nearly submitted him on multiple occasions, but the Californian escaped all of the attempts. Ewell turned the tides in the second with precision striking and then badly rocked Barao (36-7) twice in the third with crisp punches to the head. In the end, two of the three judges favored Ewell (14-4) with scores of 29-28 while the third had the same score for Barao. Veteran strawweight Randa Markos badly needed a win tonight but newcomer Marina Rodriguez (10-0-1) was tougher than expected. The women battled it out for three rounds, each landing plenty of solid strikes and grappling it out on the canvas. Neither woman ever had the real advantage in the contest through rounds two and three, and in the end, the result was a majority draw. One judge had it 29-28 for Markos (8-7-1) while the other two had it even at 28-28. Charles Oliveira made history on Saturday by scoring his 11th submission win in the UFC, breaking the iconic Royce Gracie’s record of 10 in the process. “Do Bronx” did it against Christos Giagos, with whom he forced to tap out with a textbook rear-naked choke in the second. Oliveira (24-8) traded punches with the Californian at will, but when he wanted to, he took “The Spartan” down with ease. The end came officially at 3:22 of the second when Giagos (15-7) had no chance of escaping the flawless choke and tapped out.